Office chairs have come a long way from the way they looked and performed in their initial days. Today you can you can swivel around, lean back or sit comfortably all day in ergonomically designed chairs and you won’t even want to get up from them. But how do you choose one from the bewildering number of options out there in the market? Here is our review on an affordable and quality office chair that will look great in both your office and home set-up. 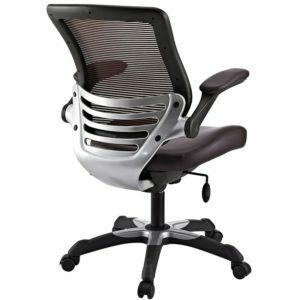 What is a LexmodEdge office chair with mesh back? If you are looking for an office chair to buy for yourself, you will surelywant to run out the back door trying to sort through the zillion options out there. Or you can make your life easier and read our review on the LexmodEdge office chair with mesh back. No more fancy looking chairs that leave you with a sweaty back as this one comes with a totally breathable mesh back and much more. Read on as we tease out the features of the Lexmod Edge range of office chairs. Before we dig deeper, here is a quick look at the pros and cons of the LexmodEdge office chair with mesh fabric seat. 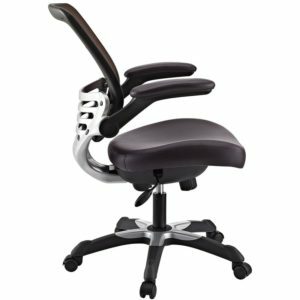 Is the LexmodEdge office chair with leatherette seat a good choice? If you want an ergonomic chair that also looks stylish, then the LexmodEdge office chair with leatherette seat will be a good choice for you. This comes with the Lexmod Edge mesh back and a leatherette seat for the sophisticated touch, but without the cost involved in a leather chair. Is the LexmodEdge office chair with mesh back and black leatherette for you? The LexmodEdge office chair with mesh back and black leatherette comes with a breathable mesh back and a black leatherette seat for those who like the rich look of leather in their chairs. The inexpensive black leatherette achieves the elegant look of leather combining function and style in to an affordable price tag. Do you need a LexmodEdge office drafting chair? The LexmodEdge office drafting chair is the perfect answer to those who want a chair to go with their drafting tables. It comes with a breathable mesh back and a leather seat for a sophisticated look. What sets this chair apart is its chrome foot ring which lets you work at different heights without letting your legs hang loose. Is the LexmodEdge office chair ergonomic? It’s brilliant how the LexmodEdge office chair ergonomic design works without a solid back structure. The mesh fabric of the backrest has been tightly wrapped around the frame that is bent to provide the required back support. You can also adjust the height of the chair with the side-levers and adjust the tilt tension according to how much recline you want in your chair. But the best feature has to be the flip-back armrest which comes handy if your table is too low to accommodate the armrests. Is the LexmodEdge office chair with black mesh back and mesh fabric seat durable? The materials used in the LexmodEdge office chair with black mesh back and mesh fabric seat are of high quality and the fact that the chair is BIFMA tested and approved stand testimony to its strength and durability. A strong plastic frame sits on the heavy-duty base supported by a metal tube in the center. How comfortable is the LexmodEdge office chair with white frame and black mesh seat? 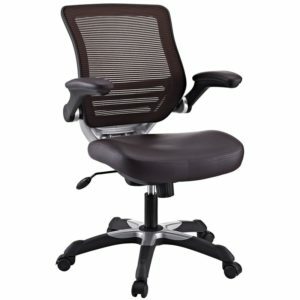 The LexmodEdge office chair with white frame and black mesh seat is not just great on looks but is high on comfort too. The mesh back is not just for breathability but is held under tension in the backrest’s frame to provide excellent lumbar and back support. While the foam seats are great, heat build-up can leave you feeling sore. The mesh seat allows the seat to breathe and diffuses the heat so that you can sit comfortably for extended periods of time. The seat can be adjusted for a comfortable sitting height and to match the height of most working tables. Another good place to look for feedback about this chair is from LexmodEdge office chair customers review. But we have covered those details here to make your life easier. Users of this chair love its breathable back and the flip back armrests, not to forget how comfortable the chair is. With no major gripes, this chair wins with its futuristic looks and features that make it a great buy at its affordable price point. Im writing this review almost at a full year of use. So I think this should be helpful. First, DO NOT buy this chair, save your money and wait to buy a real chair. 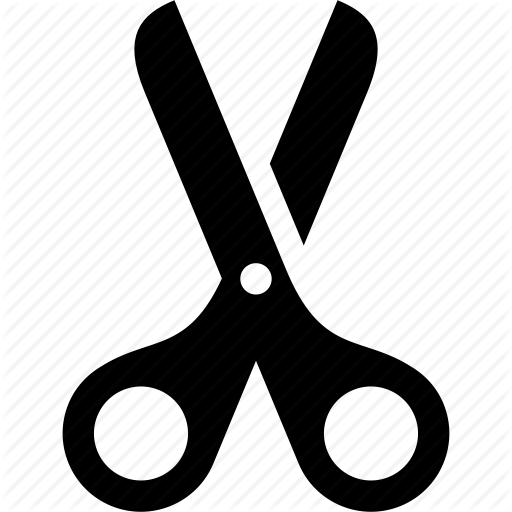 You are better off going to walmart and buying whatever they have there, at least to hold you over till you saved enough for a Herman Miller or the like. Worst costumer service I have ever dealt with, allow me to explain. About a week ago, I leaned back in this chair and the mesh outer frame on the back cracked completely, only thing holding that side is the inner frame that the mesh is stapled to. I am an average size male, I use this chair in my home studio, I particularly liked this chair for the fold up arms. Well, the rivets in the under-seat mechanism are loosening, and the amount of squeaking and creaking this chair has done, was already enough to want to just leave it at the curb. So wd40, thats if you can even get the straw tip in on the right spot without having to take the whole thing apart just to lube it. When I first got the chair I was impressed, for maybe two months, then the squeaking and the loose rivets. I figured ok, not the best chair in the world, but at the end of the day the money spent was money earned that I worked for, and for a seat I didnt get my moneys worth, at all. Ok, so I broke it leaning back in it, because the mechanism is weakened from loosening parts, so I emailed the company, and after about 5 days of pity pat with them with nonsense requests about my purchase, almost like it was some test if I really owned the chair or I was a fraud. I did not once feel like a respected customer, that they wanted business from. They dont care, so I finally got the invoicing thing straight with them, and they tell me this ” I checked with our claims manager and we have the back for this item in stock.The cost with shipping is $65.00. This purchase is non-refundable. Also, since the order was fulfilled by Amazon’s warehouse, we cannot guarantee that the part we carry will fit the chair you have.” thats a copy and paste from the email I received from them at “Sugar stores” so, not only will the outer frame cost me 65, I will not know if its the right part, and if it is wrong I dont get my money back? Even if I was gonna pay the 65 for the crappy frame I epoxied for now till I save enough for a real chair, I wouldn’t do it knowing they wont refund me my money if they send me whatever part they pretty much feel like? wow. Please, save yourself some money and dont buy this cheap crap. Your money means nothing to them, so please do not support this company. Buy American made. Im sorry I ever bought this. Its junk, oh yeah when I bought it I paid a lot more than the current asking price, so that tells you something right there. I hope this helped some. Feel free to ask me any questions, and I will get back you as soon as I can. We hope our LexmodEdge office chair review has given you enough information to help you decide if this will meet your needs. If you are looking for an ergonomic chair that you can sit all day and not feel fatigued, then the the Lexmod Edge office chair will be a great option and one that also comes at a pocket-friendly price.